Celebrating Green People`s 20th anniversary with special edition organic skin care blended with an exquisite floral aroma. Deep and complex aroma blend rarely found in natural cosmetics. Jojoba and Rosehip oil work in synergy to restore skin`s suppleness and elasticity. Thistle Seed, Sweet Almond and Avocado improves skin texture and firmness whilst locking-in hydration and reducing the appearance of fine lines and wrinkles. Precious Rose Otto is blended with Lavender, Basil and Marjoram to calm and soothe along with Lemon peel to balance and brighten a dull complexion. Luxuriously light with a silky skin feel that won`t block pores. After cleansing and moisturising, apply to your face, neck and décolletage with light tapping motions. Avoid direct contact with eyes. If irritation occurs, cease use. 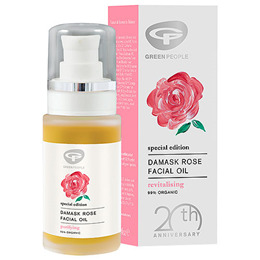 Below are reviews of Green People Damask Rose Facial Oil - 30ml by bodykind customers. If you have tried this product we'd love to hear what you think so please leave a review.